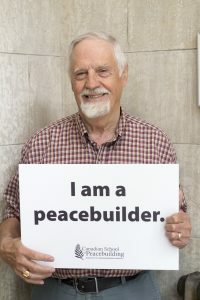 At 81 years old, Rudy Friesen may be the oldest participant at the 2017 Canadian School of Peacebuilding (CSOP). Friesen attends the same church as Valerie Smith, Co-Director of the CSOP, and says he’s had many opportunities to hear about it over the years. A retired teacher, Friesen volunteers his time tutoring recent immigrant and refugee youth at Grant Park High School in Winnipeg, MB. At the CSOP, Friesen took Peace Resources in Islam and Christianity, taught by Dr. Mohammad Ali Shomali, founder of the International Institute for Islamic Studies in Qom, Iran, and Director of the Islamic Centre of England; and Dr. Harry Huebner, Professor Emeritus of Theology and Philosophy at Canadian Mennonite University. What he’s learned at the CSOP is very applicable to his work tutoring newcomer youth. “I want to encourage them,” says Friesen, observing that the transition for these young people can be difficult.